We Carry a Variety of Wholesale Bicycle Liquidation Lots. Please review the listings below for further details. Trailers come floor loaded as pictured. Approximately 250 units per Load. Loads are unmanifested and there is no firm unit count. Brands can include: Mongoose, Trouble Maker, Razor, Vitesse Racing, Deluxe, Columbia Built, Dynacraft & more. Some models may include: (Mongoose) R1504WMB,R1495WMB,R1840WMA; (Schwinn) S2508WMB; (Huffy) 51975, 51935, 52955; (Dynacraft) DJ07202015; (Roadmaster) R3012WME. * Loads may also include Licensed Bikes such as Disney, Hello Kitty, Minions etc. Loads are unmanifested, have a mixture of adult and kids bikes as well as a mix of out-of-box and in-box bike which will vary from load to load. Please see pictures to get a better understanding of the kind & condition of bicycles found on those loads. We do not floor load bicycle containers from our facility. Approximately $1,275+ to receive, unload, consolidate & reload in to a single ocean container paid directly to Freight Forwarder. Shipping Cost of ocean container will depend on destination – please inquire for shipping quote to your country. While many units may be in perfect condition, Dents, Scratches, bent frames, handles, incomplete sets, missing parts etc. can commonly to be found on a % of the units. 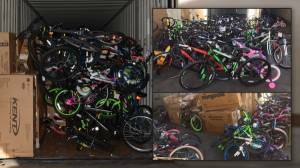 Liquidation of Me-Mover Stand Up Bikes! This is an opportunistic liquidation of Me-Mover Stand up Bikes by the pallet. The Me-Mover is an outdoor step machine on wheels and gives you an efficient full body workout while cruising around the outdoors and enjoying the fresh air. Colors include: Black, Green, Light Blue, White, Orange, & Silver. All pallets will be mixed colors. The majority will be black, but there is no guarantee on the colors you will receive. Each unit retails for $1,799. Your price is $500/unit, or $5,000 for the pallet of 10. Reasonable offers for less are considered. The Me-Mover activates 6 of 8 major muscle groups, so you get more exercise in less time. It is a full body trainer that gets you fit faster. It is a high intensity workout, low-impact, and a blast to ride. Great product for Retailers, Online Sellers, Sporting Goods Stores, Export, & more!